Magnolias are a traditional sign that spring has arrived with their huge buds that burst into colour early in the season. This rare hybrid 'Yellow Bird' really is unusual, and made even more so as it has been grafted to make a half standard lollipop form with a clear stem beneath. In spring it bears huge lemon yellow flowers, sometimes streaked lime green, emerging just before the deep green leaves unfurl. Magnolia 'Yellow Bird' is still easy to grow, and hardy to -15C, forming a nice medium sized specimen garden tree. Magnolias are a traditional sign that spring has arrived each and every year, with their beautiful huge buds bursting into colour early in the season. Most Magnolia are pink or shades thereof, so this rare and fabulously unique hybrid 'Yellow Bird' really is unusual, and made even more so as it has been grafted to make a half standard lollipop form with a clear stem beneath! Magnolia ‘Yellow Bird’ bears the most wonderful huge lemon-yellow flowers, sometimes streaked lime green, emerging just before the deep green leaves unfurl in the spring. Easy to grow, it’s already been grafted into a half standard form with a ball of foliage atop a long clear stem, hardy to -15C (although best to avoid windy sites) and with just a little prune to shape will form a nice, low maintenance, medium sized specimen garden tree. Supplied as a bare root tree approx 70-80cm tall, ready for immediate planting. Supplied as a bare root tree in standard form, at least 80cm in height, supplied dormant for winter and spring planting. 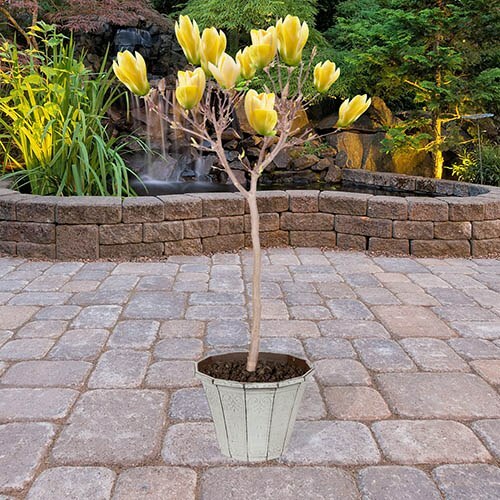 Plant magnolias in a sunny or semi shaded position with protection from cold winds and hard spring frosts. On receipt, soak the roots in water for at least two hours. If you can't plant straight away, they should be fine for up to a week if left in a cool, dark, frost-free place - keep the bag around the roots with some water inside. For all trees, we highly recommend using our Tree Planting Kit. You only need to support the bottom half of each trunk, so push 40cm of each stake into the soil next to each tree. With the soft tie, make a figure of eight around both the trunk and stake, and fasten it off - your tree will now be better protected from strong winds. Water the plants weekly - especially in dry weather - for the first 8 weeks or so - do not allow plants to dry out in the first four months after planting.